We generally associate the covers of James Avati with Erskine Caldwell-esque scenes of soft summer nights and languorous figures, albeit rendered with an undercurrent of tension and dissatisfaction. Here is a rare venture into the crime and hardboiled milieu for this usually restrained artist . Mafia shows that Avati could boil hard with the best of them; the book is executed (no pun inteneded!) with his usual low key lighting but he sure gets the message across – the cover depicts a hit man putting a gun back in a shoulder holster as he looks down at a dead guy sprawled on a table. Here Avati’s preference for earthy tones suits the gritty subject matter perfectly. 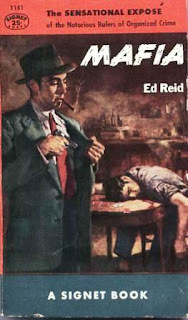 The book’s presentation is such that it looks more like a novel than nonfiction, in fact I thought this was the case until I did a little research and discovered that the book indeed is nonfiction, a mid-century classic on organized crime in America, a collection of 16 stories of the Mafia and its members, to be precise. In the popular imagination old, or vintage, paperbacks – particularly those of crime fiction – are generally thought of in terms of “good girl art,” “lurid,” “sensationalist,” or “pulp fiction,” as portrayed in over-the-top glory by publishers like Avon, Popular Library and the like. Avati and Avati-influenced covers, with their Rembrandt-esque lighting and predilection for browns and grays, are really a different strain in the popular culture and can be thought of as a different school altogether.